The opener is coming to the Bronx ... and not just when the Rays visit. The Yankees intend to use the opener strategy, popularized by Tampa Bay last year, during the 2019 season, having relievers begin games before handing off to whichever pitcher would normally start in certain games. "I would say there's a good chance we will use [openers]," Aaron Boone told reporters Tuesday. Presumably, New York would utilize openers for their younger starters, namely whoever wins the competition for the fourth and fifth rotation spots between Luis Cessa, Domingo German and Jonathan Loaisiga. 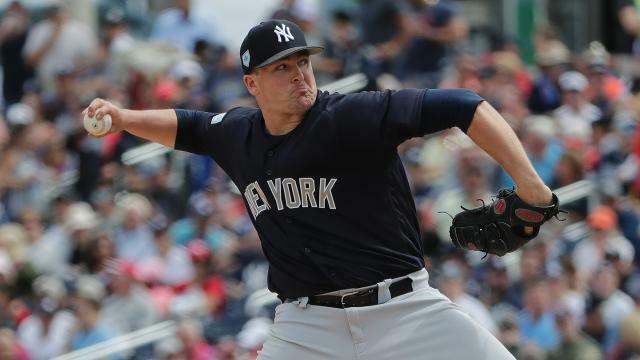 Chad Green and Jonathan Holder would be the prime candidates to open those games as they did Tuesday and Wednesday, respectively, in Grapefruit League action. The "why" of the opener is simple: The only time a team is guaranteed to have the top of its lineup come to the plate is the first inning. Therefore, they ostensibly have their best hitters at the plate, so the opener gives a fresh, one-inning reliever a chance to face those hitters rather than your weaker starters. With a healthy rotation, the Yankees wouldn't need the opener. Luis Severino and CC Sabathia, however, will begin the season on the injured list, with Severino potentially out until May. Recent signee Gio Gonzalez can also start, but he's still getting stretched out. That leaves the two open rotation spots and plenty of time to experiment. Boone used the strategy for one game during the 2018 season, and it worked as designed. On Sept. 24 -- ironically against the Rays -- the Yankees started Holder, who escaped a first-inning jam unscathed and gave way to Stephen Tarpley for another scoreless inning. From there, the team used Sonny Gray, the typical starter, for two innings before going inning-by-inning with the bullpen. Having the extra arms with September roster expansion enabled Boone to use the opener in a traditional bullpen game without wearing out his relievers. It's one thing to try this out with that expanded roster and another to utilize it consistently early in the year. The Rays made it work last season by consistently carrying 8-9 relievers while shuffling the last 1-2 of those pitchers on and off the 25-man roster as needed. That will be more difficult to do in 2020 with new option rules (players needing to stay down for 15 days instead of 10), and it will be harder this year for the Yankees, who seemingly have a more set-in-stone bullpen. Therefore, the Yankees will still need Cessa or German, the probable winners of the rotation competition, to carve out a significant portion of the game, just not the first inning or so. The bullpen equation is further muddled by Dellin Betances' shoulder inflammation, which forces the big man from the Opening Day roster. Still, the Yankees' veteran core of All-Star relievers could work in favor of the opener, allowing Boone to shift his focus from the banged-up rotation to MLB's best bullpen. The opener strategy has its detractors, in part for its aesthetic compared to a normal starter-dictated game. The scheme's credentials as an effective option, however, are clear. Tampa Bay had the fifth-best ERA (3.61) in the first inning last season, while putting up the best overall mark in the American League. The Yankees, for reference, were fourth overall in the AL at 4.11. The Rays were able to limit their exposure to the opposing team's best hitters for their less-effective starters. While some of the Yankees' veterans could work well with a starter, the change to their warmup and routine isn't worth the fight. For a pitcher with recent bullpen experience like German, who had an 8.36 ERA in the first inning last year, the opener could change the course of a usual game for the better. If the big-market teams are adopting Tampa Bay's opener strategy, that signifies potential widespread acceptance and may lead to its proliferation. The Yankees may only use it temporarily, but the opener could have significant positive results in the Bronx this season.